Considering how many wonderful beaches there are in Los Angeles, and how much Angelenos love their dogs, there are surprisingly few beaches where the dogs can enjoy the sun and surf with their humans. 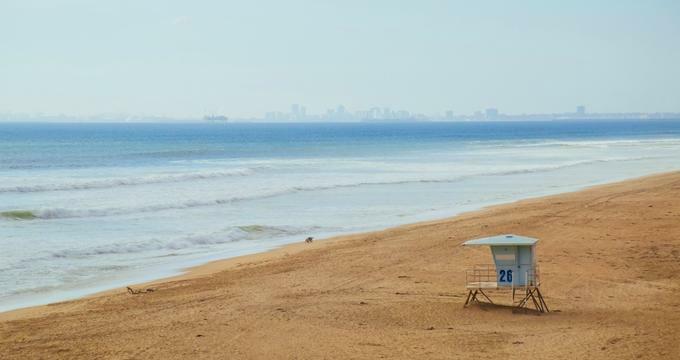 Only two beaches allow them a leash-free romp – Huntington Dog Beach in Huntington Beach City and Rosie’s Dog Beach in Long Beach. A few other beaches allow dogs to visit on a leash, such as two beaches in Leo Carillo State Beach, and while dogs are allowed in Point Fermin Park, they are not allowed onto the beach. The northern part of the magnificent 3.5-mile-long Huntington Beach City Beach, between 21st Street and Seapoint Street, is doggy heaven. The dogs are allowed to run and splash in the surf leash-free while their humans are working on their tan, surfing, or playing volleyball. You will notice the sign that says that dogs have to be on a 6-foot leash, but nobody will bother you if your dog is off leash as long as they behave well. Locals know that, and they do not bring unruly and aggressive dogs to the beach to avoid paying the fine. On the bluff above the beach runs the Huntington Beach Bike Trail, where you can go to stretch your and your dog’s legs, have a bit of a run, or rollerblade and get your pooch tired out; dogs have to be leashed here. A short drive on Goldenwest will take you to the nice Park Bench Café, where you and your best friend are welcome to come for a bite and a drink. 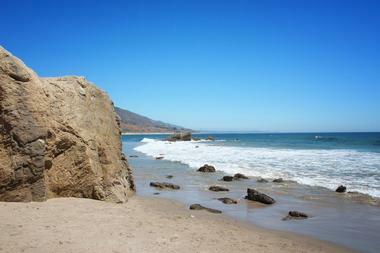 One of several beautiful beaches in Leo Carrillo State Park in North Malibu, North Beach is a wide sandy beach popular with families and dog owners. Access is easy and parking is on the beach itself. The area where the dogs are allowed, and have to be leashed, is just north of lifeguard tower 3. The beach is fun to explore, and your dog will enjoy sniffing about the large black boulders scattered on the sand, checking out the tide pools at low tide, or exploring the interesting caves and stone arches. 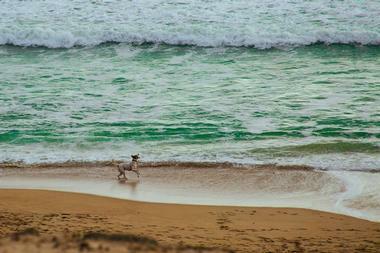 There are a number of trails off the beach through the park where dogs are allowed. 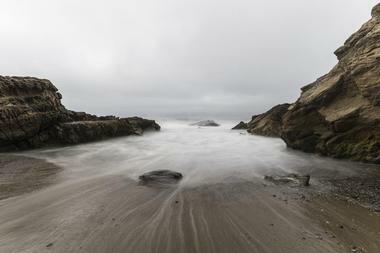 Very popular with surfers because of the powerful surf year round, Staircase Beach in the north part of Leo Carrillo State Beach is little known or used by regular beachgoers. 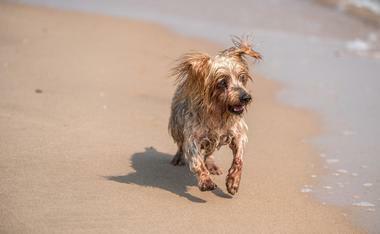 Besides surfers, the beach, which actually has no stairs, is used by dog owners and their dogs for a romp in the sand and surf, as long as the dog is on a leash. The beach is accessed by a steep and narrow trail that goes down the face of the bluff from the parking lot. Another way to get to Staircase Beach is from North Beach across the sand. 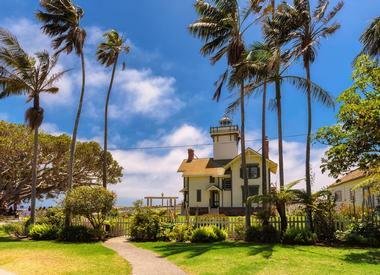 Point Fermin Park is a lovely, spacious park owned by the City of Los Angeles with a lighthouse, great facilities, a large grassy space, and fantastic views. Below the park’s steep bluffs is Point Fermin Beach, a rocky, narrow beach with interesting tide pools that is great for beachcombing. The beach can be accessed by the trails running from the park’s west end from Leland Street and from Roxbury Street. While dogs are not allowed on the beach itself, you and your dog can enjoy a stroll through the park’s grassy expanse as long as your dog is on a leash.